Bristol Street Motors Vauxhall in Carlisle has helped raise money for Cash for Kids by hosting a family fun day for members of the public. 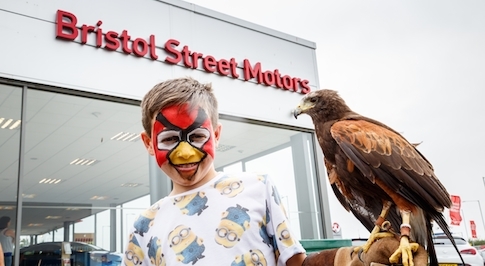 The Parkhouse Road dealership was joined by birds of prey and eight-legged creepy crawlies to host the family fun day, which saw more than 100 visit the dealership. Raising more than �1350 for Cash for Kids, the dealership fun day also featured face painting, tombola, cake stalls, barbecue, hot and cold beverages and a treasure hunt with prizes. Cash for Kids is run by Bauer Radio's network of local charities, which operates across 21 areas around the UK including CFM radio station in Carlisle. The charity responds to the needs of children in local communities, and strives to let children live life to the full and achieve their individual potential. Michael Breen, General Manager at Bristol Street Motors Vauxhall in Carlisle, said: "The fun day was a great idea and we are pleased that we could raise money for such a worthwhile charity. It was a great opportunity for everybody at the dealership to engage with members of the local community and the children really enjoyed the entertainment. "Here at Bristol Street Motors Vauxhall Carlisle, being part of the local community is very important to us and we are grateful that we could host this day and raise money for a good cause. Members of the community are always welcome to visit us at the dealership and speak with members of staff."